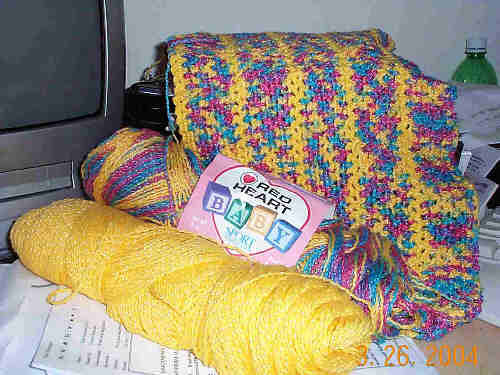 In 2005, I was part of an online group called All Crafts 4 Charity and this was one of the items I would make and donate. Several other members asked for the pattern so I contacted Caron and asked if I could put the pattern on my website for the group. They gave permission since it was from a ball band and wasn’t available on their site. Please don’t repost this pattern to any other website without express permission from Caron. Linking to it is fine. Approx. Yardage 1 skein each White, Pink, Blue, Yellow, and Green. If using Pompadour yarn, use 2 skeins each color. 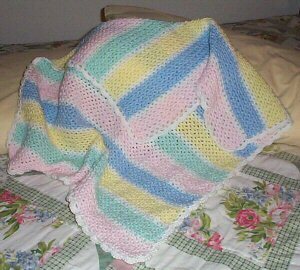 Resizing This afghan may be easily enlarged by adding any multiple of 3 stitches to your beginning chain. Be sure to purchase an extra skein of each color if you decide to enlarge. Base Chain With pink, chain 151. Row 1 Sc in 3rd ch from hook, * ch 2, sk 2, sc in next st *, repeat from * to * across row, ending with sc in last ch, ch 1, turn. Row 2 (pattern row) Sc in 1st sc, * ch 2, sc in next sp *, repeat from * to * across row, ending with sc in turning ch, ch 1, turn. Rows 3-8 Repeat row 2. Join white in the last st of row 8 by pulling it through the last half of the last sc of row, cut pink. Rows 9-10 Repeat row 2 using white. At end of row 10, join blue as above. Rows 11-18 Repeat pattern with blue. Rows 19-20 Repeat pattern with white. Rows 21-28 Repeat pattern with yellow. Rows 29-30 Repeat pattern with white. Rows 31-38 Repeat pattern with green. Rows 39-40 Repeat pattern with white. Rows 41-121 Repeat color pattern in Row 1 – 40 two times more, ending with one more repeat of pink. Round 1 With white, join with a sl st in any ch-2 sp on one of the ends. *Ch 2, sc in next ch-2 sp*, repeat from * to * across end, placing 2 sc groups in corner. Continue with *ch 2, sc*, repeat from * to * up the side, placing 3 sc groups in each color stripe, 1 sc group in each white stripe. Continue around afghan, maintaining 2 sc groups in each corner, and following pattern as set for remaining end and side. Join with sl st to beginning of round. Round 2 Ch 3, 4 dc in same sp, sc in next sp, * 5 dc in next sp, sc in next sp*, repeat from * to * around afghan. Join to beginning of round, finish off. Wash and block as needed. Pattern copyright by Caron International, posted on this site only by special permission from Caron. Do not repost anywhere else without permission from Caron. Originally posted on 6/11/05. Reformatted on 12/10/13 and added PDF download.